Dept. of Dodger Stadium Express: The free bus from Harbor Gateway and Union Station to the ballpark will be running for all post-season games, starting with tomorrow’s game against the Cumberland Braves. More here on the DSE. One intriguing scenario: the A’s and Dodgers meeting in the 2018 World Series, 30 years after Kirk Gibson neatly ended Game One. The celebration ended at the orchestra’s free evening Bowl concert…Throughout the day, a staggering 1,800 performers (dancers included) participated from all walks, so to speak, of musical life. Make that 1,800 and one, but more about that later. 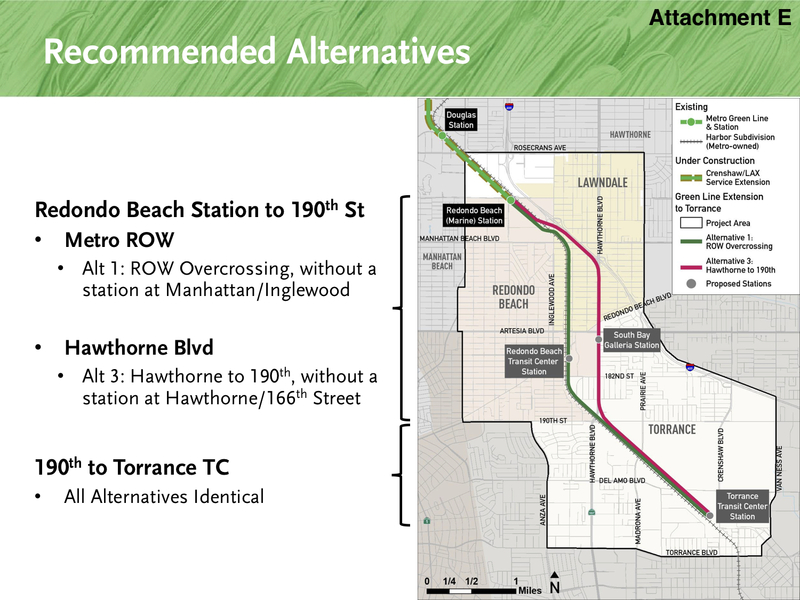 The two alternative routes that Metro is studying for the project. The state bullet train hasn’t exactly received a warm welcome in the northeastern San Fernando Valley, writes columnist Steve Lopez. He also believes residents are asking good questions about whether there’s money to get the train this far south. Some readers respond that the project is worth it — and hardly the only expensive government project (think military jets). Among Seattle-area residents with a salary of $75,000 or more, 11 percent typically took transit to get to work in 2017. That’s higher than any other income group. Less than 10 percent of workers with wages below $35,000 took transit. In the San Francisco area, transit skews most heavily toward the affluent — 20 percent of those earning at least $75,000 were transit commuters, compared with about 15 percent of those earning less than $35,000. The other metro areas in this group are Chicago, Washington, D.C., New York and Boston. Everywhere else, poorer folks are more likely to take transit — in Los Angeles, nearly four times more likely. The article doesn’t definitively explain why this is the case — suggesting that perhaps the reason is that Seattle has invested more heavily in new projects than most other areas. High Speed Rail is not supposed to be local rail. Why they don’t run it down the middle of Interstate 5 is very questionable. Much of the freeway has a huge medium that could easily accommodate the tracks in both direction. In addition there would be no cost to acquire property. And then this political ploy of running the trains via Palmdale is complete stupidity. They built a Airport there only to have to shut it down due to low patronage. What makes them think a large group of people will be traveling to and from San Francisco or Sacramento from there? 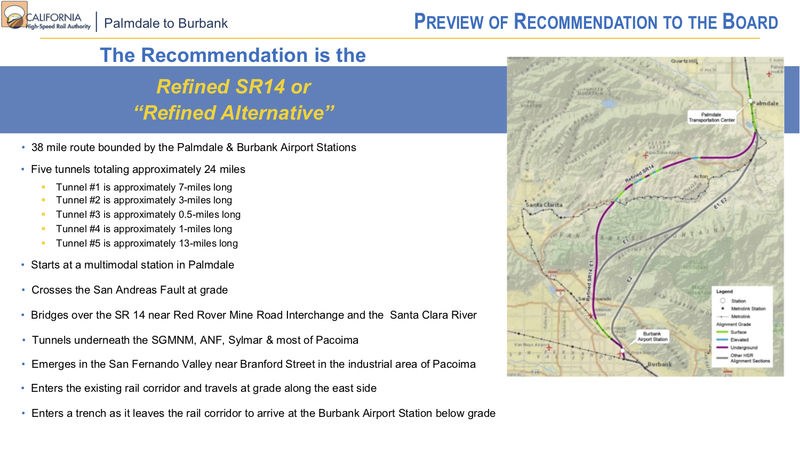 With respect to HSR down the middle of the 5, Caltrans probably balked at having future expansion made more difficult. The Palmdale connection and possible connection to rail from Victorville and then Las Vegas is in its favor- plus the fact that a significant percentage of folks in Palmdale leave the area for work (particularly for Los Angeles). Imagine the commutes via HSR- from 1 to 2 hours by car to 20-30 minutes. Still, the deviation is hard to justify if Palmdale doesn’t densify. No love for Bakersfield, Fresno, Merced, Modesto or Stockton? The point is to connect LA and the Bay Area, and points in between. Would be economic development for some of the poorest areas of the state, and connect affordable inland housing with higher paying coastal jobs. As two large cities without an interstate highway, Fresno and Bakersfield must be served by HSR. Because of the mountain geography of the Grapevine Interstate 5 route, The HSR would have had to cross the SAF in a tunnel, which is probably safe, but would undoubtedly be a major political flashpoint, subject to even more and more interminable lawsuits as well as potentially terrifying ridership, given the media would obsessively blow it way out of proportion. Therefore, crossing the SAF in the high desert, at-grade, is seen to be far more preferable. Interstate 5 is not suited to the rest of the HSR route because it bypasses California’s major cities. Two of those major cities are not even connected to the interstate system. Expanding their feeder State Highways into the Interstate system would cost more than 77 billion by the way–and an enormous amount of the HSR ridership is going to be ridership OUT of these cities TO the destination terminus cities. I think it is a bit less than 20% of HSR ridership is estimated to be LA-SF terminus to terminus trips. That is to say that an HSR that took the Interstate 5 route would have ridership more than 80% less than the current HSR route. In terms of building within the Freeway median. no, it actually isn’t wide enough. Not only would it necessitate building protective barriers to separate cars and trains, you would also have to relocate the freeway to make the median wider. And doing it in the median DOUBLES (or more) both the costs of building protective barriers (you have to build it on both sides), and you probably have to relocate both sides to widen the median (and stay within the freeway right of way). Not to mention you have to work every single decision through CalTrans and the feds in order accomplish anything. A better approach would be Freeway ADJACENT, which would necessitate building only one protective barrier between the freeway and HSR tracks, could consume much of the right of way, and would minimize freeway relocations (causing the freeway to shift away from the tracks). Just cause it looks like easy common sense (use that thar land in da middle, taint no one usin it anyhow) does not mean it actually is, because Freeway median is actually a more dangerous and more expensive project to engineer. My hope is that one day, L.A. will be able to move toward more focused bus routes designed to serve neighborhoods – with trips within neighborhoods, and trips between adjacent neighborhoods. For this to happen, we need to keep building rail and BRT to cover the long-distance (regional) trips. And we need to design more focused (neighborhood-centric) shopping areas, rather than sprawling shopping boulevards.